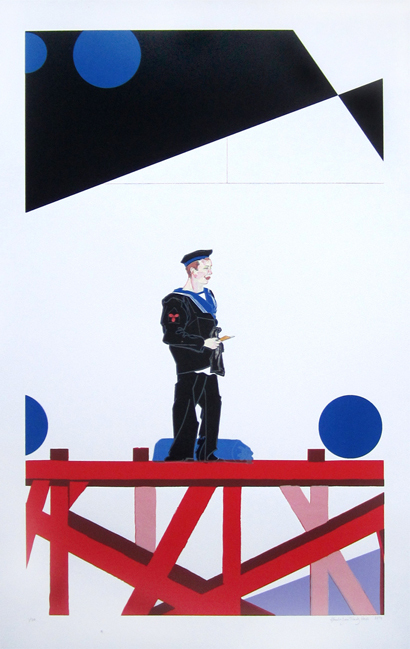 Embarkation On A Dazzle Ship is the fourth of four screenprint limited editions that mark the First World War Centenary in 2014. 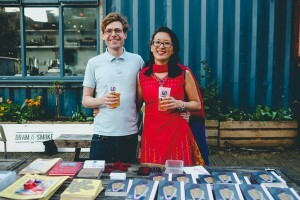 These were commissioned for sale as limited edition screenprints and for reproduction as colour plates in a replica of the Active Service Gospel. Our colour plates introduce the legacy of the First World War into a document that lived in the trenches. The tragedy of WW1 is absent from its pages because it unfolded around them. SGM asked us to reference the Modernist artwork of the time, exploring the tension between Vorticist individualism and Futurist machine-worship. We found the Scripture Gift Mission story as interesting as it is moving. Their tradition of offering gospels without any social agenda attached, to anyone who wants or needs one, allowed them to mass produce words of comfort and encouragement without partiality, during a war where words had already been slain by mass-produced propaganda. A staggering 42 million Active Service Gospels were made, a testament to the demand. Some were accepted gladly, others with derision, and some with derision that became devotion. The trenches were a place where some lost faith and others found it. The story of the Active Service Gospel is a little-known history, one that highlights the fact that nothing that comes off a printing press is neutral.